Perhaps the most popular island in all of the Florida Keys is Key West and it hosts a diverse choice of visitor accommodations for vacationers to choose from. Situated just 90 miles from Havana, Cuba, and sporting a year round tropical climate, there are delighful resorts and spas, numerous hotels from small to grand as well as private inns, quaint guesthouses, charming bed and breakfasts and many private homes with guest cottages. Key West also boasts many national hotel or motel facilities that cater to the family traveler and also tourists that are on a buget. These venues feature the common amenities that one would expect to find at a national chain hotel plus many are situated just a few steps from downtown Key West's famous Duval Street. "Old Town" hosts attractions like The Hemingway House, Sloppy Joe's Bar, Jimmy Buffet's Margaretville, The Key West Aquarium, The Mel Fisher Maritime Museum, Cowboy Bill's Honky Tonk Saloon plus local theaters, exhibits and many, many other tropical attractions. Key West charming guest houses are very popular in Key West. Many are original antique style "Conch" houses that have been carefully restored and turned into wonderful guest accommodations. Full suites with modern kitchens and private rooms can be found at these guest houses. Some include private guest cottages and clothing optional outdoor Jacuzzi spas and pools for nudists. Other guests houses are marketed to the gay and lesbian community and these properties often host gay events and festivals. 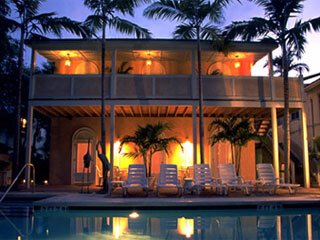 Key West welcomes it's vacation visitors with quaint inns and bed and breakfast accommodations. Here the local people open up their doors to share traditional local cooking and "Conch" style living. Key West private owned homes are available to rent on only a monthly basis, are set in amongst charming restaurants, bistros, bakeries and fabulous coffee shops. Many local restuarants feature Cuban cuisine as well as other diverse ethnic dishes. Key West restaurants cater to every taste in food, from fine dining to casual off the sidewalk restaurants. Many are open air and invite pet lovers as well as the free range local chickens and roosters that walk the streets and lanes of Key West. Check out KeysTV and its' Key West Restaurant Guide for more information. Key West's world renowned nightlife begins at the world famous Sunset Celebration at Mallory Square. Quite a few larger hotels surround the beautiful waterfront sunset celebration area and you will enjoy all of the sights and sounds right from your balcony or private terrace. Here charter sailboat cruises takeKey West tourists on sunset sails with complimentary adult drinks and delicious food. Back on land, Key West street performers of all ages entertain the growing nightly Key West crowds with feats of juggling, fire eating, tight rope walking, and unique magic and animal acts.